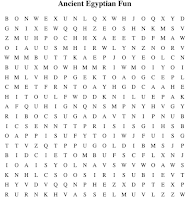 How Many Ancient Egypt Words Can You Find? 1. To begin, decide on a word to search for. (From the column on the right). 2. Scan the puzzle for your word. 3. When you discover your word, drag to select it. 4. If you got it right, the word will change color. HINT: Words can be backwards, diagonal, or up and down. Find: mummification, hieroglyphs, sarcophagus, tutankhamen, inundation, chariot, pharaoh, pyramid, amulet, osiris, temple, thoth, gods, gold, isis, nile, tomb.